Those pesky Rebels. How they love causing reactor overloads! 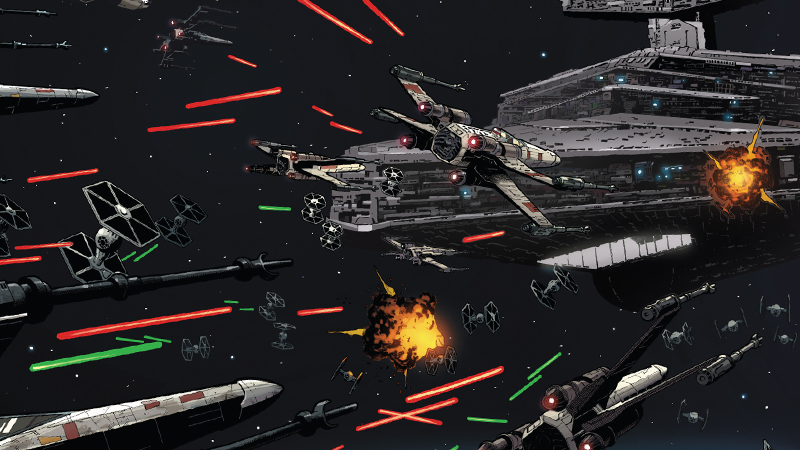 According to last week’s issue of Star Wars, the Rebels’ battle plan—maybe their only battle plan—can be applied to anything, whether it’s blowing up space stations or stealing a capital ship. Star Wars #22, by Jason Aaron, Jorge Molina, Matt Milla, and Joe Caramagna, is essentially one big love letter to the Death Star assaults in A New Hope and Return of the Jedi—but instead of blowing up moon-sized, fully armed and operational battlestations, the Rebels are attempting to hijack a Star Destroyer, by causing a reactor overload that makes the Imperial crew abandon ship so they can swoop in, repair the overload, and run off with a free capital ship. Oh dear. So turns out trying to hijack a Star Destroy is a lot like blowing up a Death Star, explosions and all. Or, it would be, if you weren’t Luke Skywalker, Leia Organa, and Han Solo, and the entire audience knows you live to appear in Empire Strikes Back. Turns out the explosion was a cover for them to jump the Star Destroyer to lightspeed, meaning that for now (and presumably for a limited period of time, since we don’t hear about the Rebels getting their hands on Star Destroyers until after the Battle of Endor), the Rebel Alliance has its hands on one of the biggest ships in the Imperial fleet. What could possibly go wrong? Everything. The answer is almost definitely everything.